On 25 June the world championship of this year in the robot football in Singapore ended. There were many German teams in different categories involved in the final games. In particular the Nao Team Humboldt (NaoTH) of the Humboldt university could reach the final in the 3D Simulation League. 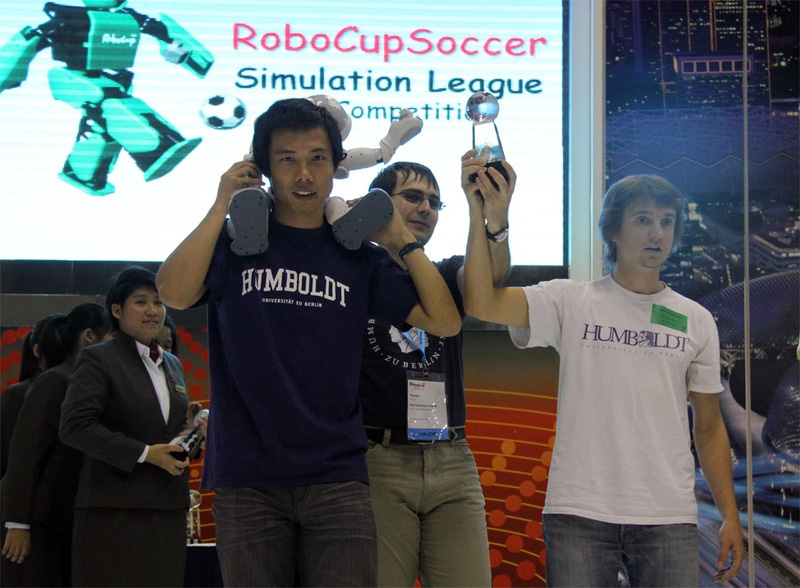 Around 11:00 clock local time the final game in the 3D Simulation League between the Chinese team Apollo3D and the Nao Team Humbold was made. Both teams had several gate chances in a very balanced and exciting game. After the regular play time ended with 0:0 it went into an extension (2 x 3 minutes), where the team Apollo3D used there opportunity in a favorable minute to make a goal. At the end the Chinese team won 1:0 but we were pleased about the second place too! The program of the NaoTH is so special because it was originally developed for the material robot (Nao) and this year it was used for the first time parallel to the Standard Platform League (SPL) in the 3D Simulation. In fact the same base of code is used for the material robots and as well for the simulation. Until today no other team could do that. This will be a bridge between simulation and the material world which no one exists until now.